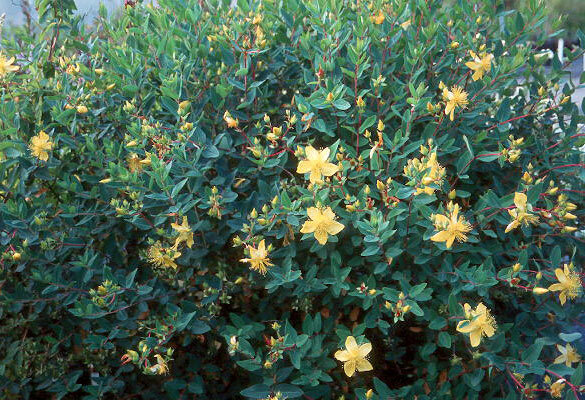 Semi-evergreen shrub, rounded, bushy, 3 ft (0.9 m) × 5 ft (1.5 m), arching shoots. Leaves simple, opposite, elliptic to ovate, 6 cm long, bluish green above, paler below. 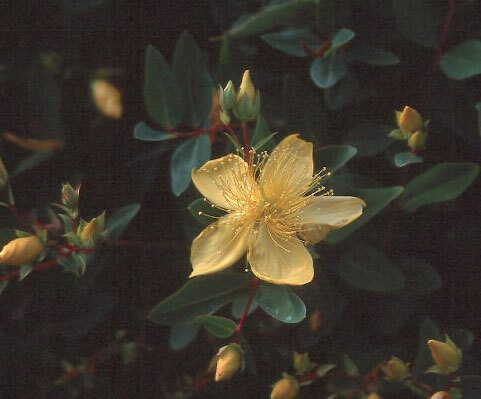 As many as 11 flowers per clusters, each golden-yellow, about 6 cm across, flattish, long showy styles and many stamens, partially reflexed petals. Fruit bright red berries (capules) with star-like calyxes. Hardy to USDA Zone 6 Native to China. Reportedly an invasive weed in Hawaii. Some authorities, including the Royal Horticultural Society, consider H. ‘Sungold’ to be synonymous with this species.